Where to start decorating when you have a room this large? Fabric! And in this case, the bolder, the better. 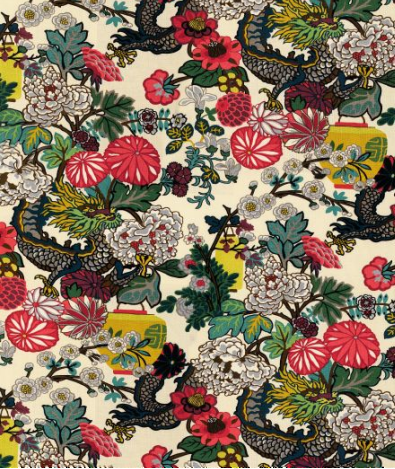 Sarah used Schumacher's ubiquitous Chiang Mai dragon fabric (at $150/yd!) as her jumping off point. I love this fabric but would a guy, a straight guy, love it enough to put it on his headboard? Any guys care to chime in on that? She paired it with leather sides on the bed and added nailhead trim. One interesting detail: she cut out the headboard corners to line up with the window sill. Think of these details - that's how you get a perfect, custom look. Anyway, from this fabric, the rest of the decor palette fell in place... mustard yellow and teal paint on the walls, antique red carpet, bold yellow lamps, linen & teal draperies, blue stools. The teal was brought in again on the ring pattern fabric on the masculine wing chair. Other details included the personal heirlooms made into art, and the big large scale accessories like the ladder and reworked vintage mirrors. Lots of good tips this week! I think too the episodes are getting better. We got to see more of that Tommy & Sarah playfulness this week - and Tommy got a bit more input into the design this time around! Love all the colour and the fabric on the wing chair, and the fabric & leather bed is great - awesome nailhead trim! My hubby, who thought the image was an awesome print (not a fabric) would not put this on a headboard - sadly... It's a great find! I love the boldness of the fabric and the blue they used on the large wall. 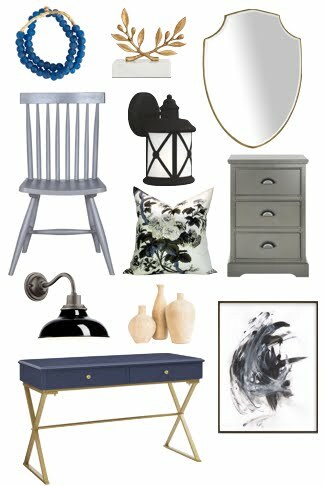 I've been working on my Master Bedroom design for a few days. This blue is exactly what I am thinking of, but I don't know how to make it work in my space. Loving Sarah's new show. must run off now to watch the episode it is on in 15 minutes! I love the way you describe Sarah 101 episodes. I'm in Australia and can't watch them. Used to watch Design Inc and loved it. I also love how you summarize her design tips. So helpful! I agree with you on the feminine aspects of the room. Personally I like it but my hubby would never have floral if I weren't around to reason/talk/cajole him into it! great work in summarizing this episode for us!! ok. .. . here is the opinion from a guy... even a gay guy, i have to say i'm not too sure about this particular fabric. Esp when it's that expensive and it's on a piece of furniture "permanently"... well at least not easy to change. other than that, i love the colors in the room and all the great tips. I also love the pendant fixture. I spotted in december as well and since wanting to get it for myself... just don't know where to put it yet. have always love the antique rug.. .a bit expensive but totally worth it. afterall, it's an investment you can take with you. Watches this episode with my husband last night. Neither of us were that into the dragon fabric, especially when it was part of the bed. The husband also didn't like the fabric paired with the rug. Overall - not a fan of this room. The kitchen re-do has been my favourite so far. My husband gasped when he saw the after and thought it looked like a romper room for kids. Yep, pretty harsh. I on the other hand, like the dragon fabric and wouldn't mind it for a pillow. Loved her industrial tables and ladder. Honestly, not that much a fan of this room. "[...] industrial chic accessories"? - not so sure that's how I'd describe the rug, the bed or much else in the room. A man-friend who saw the living room episode also thought that was way too feminine with the pink sofa, etc. Still, this will not deter me from watching the series! I still like Sarah and Tommy's methodology despite my difference in opinion on style. 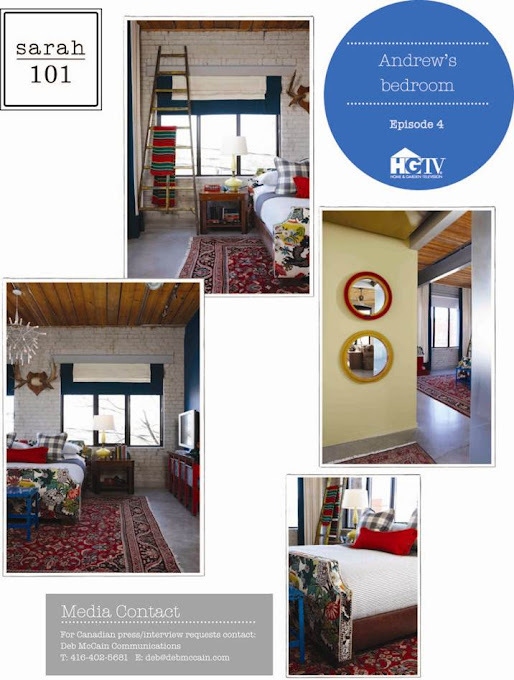 I have to say my friend and I started laughing when we watched this episode because we felt it was just too busy and weren't sure whether Andrew (the client) liked it, as all we heard him saying was how he liked the window treatments and the medal display (& i loved both too!). The dragon fabric is cool...but putting it on the headboard and footboard seems to go against everything Sarah used to say in Design Inc. about putting bold fabric/colours on accessories like pillows and keeping the main furniture simple and neutral so they stand the test of time. At least I know that our dining room wasn't the only room where Sarah went heavy on the colour (heavy for us at least), but I love my dining room now with our new chairs from Sarah and new art! Thanks for sharing Jennifer! I tried to sell D. on the Chiang Mai fabric for our room and he wouldn't go for it - he ended up with a floral paisley instead :) It adds interest to a very masculine space. That fabric is allllll wrong for a headboard / footboard. Accents? Yes. Not Sarah's best product. I agree with all the other commenters who questioned the Chiang Mai on the bed- it's a big statement, and if you ever don't like it, it's a lot to change. I personally would have used the dragon fabric on the chair, because it would be easier to reupholster if the need arose. I also think that the headboard is WAY WAY WAY too low. I understand *why* the headboard is so low (to not obstruct the windows), but it looks out of proportion with the footboard. Additionally, when the bed is made, the pillows completely cover the headboard- so you just spent $150 a yard on fabric, and then who knows how much to get a custom headboard with nail-trim detail...and it's completely invisible thanks to your bedding. What a waste!!! And, I would never get furniture custom made for a space- unless you're going to sell it with your house, what do you do with it when you move? If I'm dropping big coin on a piece of furniture, you'd better believe it's going with me to every single house I live in. I would be concerned that in any other space, the bed would look out of proportion. And the mirrors- to quote Sarah "When stacked on top of each other, they act as one full length mirror". Speaking as someone who used to have this in her bedroom- no, they do not. They act as two seperate mirrors with a space in the middle so you can never get a good idea of what your outfit looks like from head to toe. If you want the functionality of a full length mirror, then get a full length mirror. That said, I did like the way the mirrors looked. I LOVED (really really LOVED) the rug. I did not like the orange cabinet (with the TV on it). I wish that Sarah and Tommy had given specific measurements for picking the right lamp- it's great to say "bring a bunch home and see what you like", but as a non-designer person, I would find it helpful to be told something like "If you bed is X inches tall, then look for a lamp no shorter than X inches" or something, just to help narrow down my choices. And- am I the only one who doesn't distinguish between clean, dirty and "slightly worn" clothes? Maybe I'm just lazy, but dirty clothes go in the hamper...everything else goes back in the drawer or closet until next time. I don't have a "slightly worn" clothing storage area- honestly, it never occurred to me! I know I sound like sour grapes on this- I really do like the show, and I LOVE that Sarah is stepping away from her signature pale color palate towards bolder hues. I just wonder if in some cases, it's color and pattern for the sake of having color and pattern. 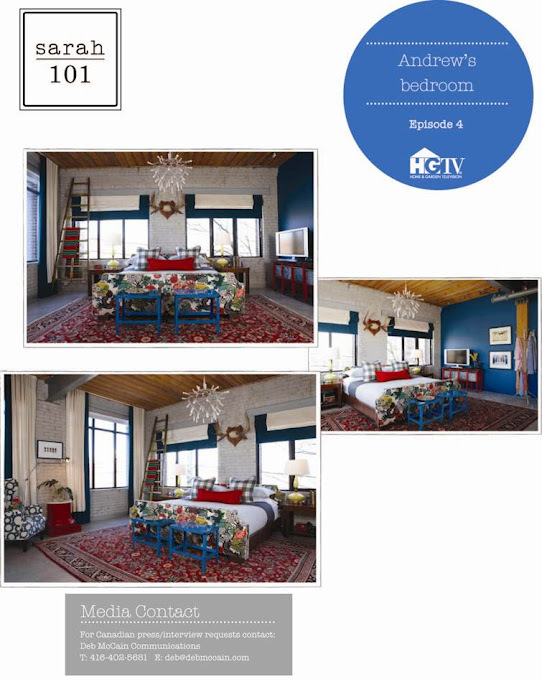 I also thought that the show would be much more "nuts and bolts" when it came to the design- like how to measure furniture to figure out if it's too big for a space, how to correctly proportion bedside lamps, how tall your dining room chairs should be, how high you should hang artwork, how many patterns is too many vs how many are too little. The tips they are sharing, on how to pick a jumping off point, and the order in which to do things are helpful....but so far, it's the same few tips over and over! Am I the only one who thinks Sarah's design is getting a little old? I used to love Room Service, Design Inc. etc but it's the same old same old...ALL THE TIME! Not a fan of this room. The room would have worked for me if the bed was ALL leather, and the blue tables at the foot of the bed weren't blue and were a more functional piece like a bench. As it was, with the very vibrant/expensive bed fabric on that beautiful rug, there was just way too much going on in the room. I miss Sarah's quiet, beautiful, classy elegant spaces. Some colour is great, but this much is jarring. everything about this room is flippin fantastic--the color, the fabric--wowza! so beautiful! I love Sarah and Tommy but we were not fans of that room. At all. I love Chiang Mai dragon but a little much on a headboard... especially in a man's space. I just don't perceive it as masculine at all and not paired with the gears pattern. Overall, we were disappointed. I can forgive though.. they've done enough great rooms! I agree, I think the headboard/footboard material it too flowery and too much pink for a guy. I also wouldn't have put it on such an expensive item to replace. It should have gone on cushions. I love the overall look of the room though. I loved the dragon fabric and while I was very unsure if a man would like it, I think the leather was a nice addition to help bring it back to being a ‘masculine piece’. It's amazing how leather can convince a man to look past floral! Interesting! Seems like none of the men or husbands polled like the fabric for use on a headboard. Hope the homeowner at least liked it! Kat - good points about the custom furniture. I too would worry about making something "too" custom that it wouldn't work in my next home. More nuts & bolts would have been good too. I think the kitchen episode was good for that, but this one, not so much. This episode was probably my least favourite so far. I agree (and posted last night! haha) that I felt that this show has been quite repetitive. so far the formula has been: punchy colour, busy pattern x10-12, and just a bit "too much" for most of the rooms from a reality standpoint. I love how Tommy and Sarah interact but I agree with Kat - I wish this show had more "nuts and bolts" to balance out just the "after" photos. But lets get real...I'm going to watch this till the cows come home...just maybe not over and over and over like her other shows. I loooovee that fabric but I agree...maybe not on the bed? Ugh. Hated this room. I can appreciate some stuff, but I did not like the "feel" of the room. I miss her calm, muted colors and soft palletes. I understand people change, but I am not into this new "bolder" fabrics and saturated color. PSS: Did not like the color on the wall, I had a room that color (dark blue) with the orangey wood wainscotting when we bought our house... needless to say we painted the crap outta that room. However the last episode was by far the worse she has ever done. 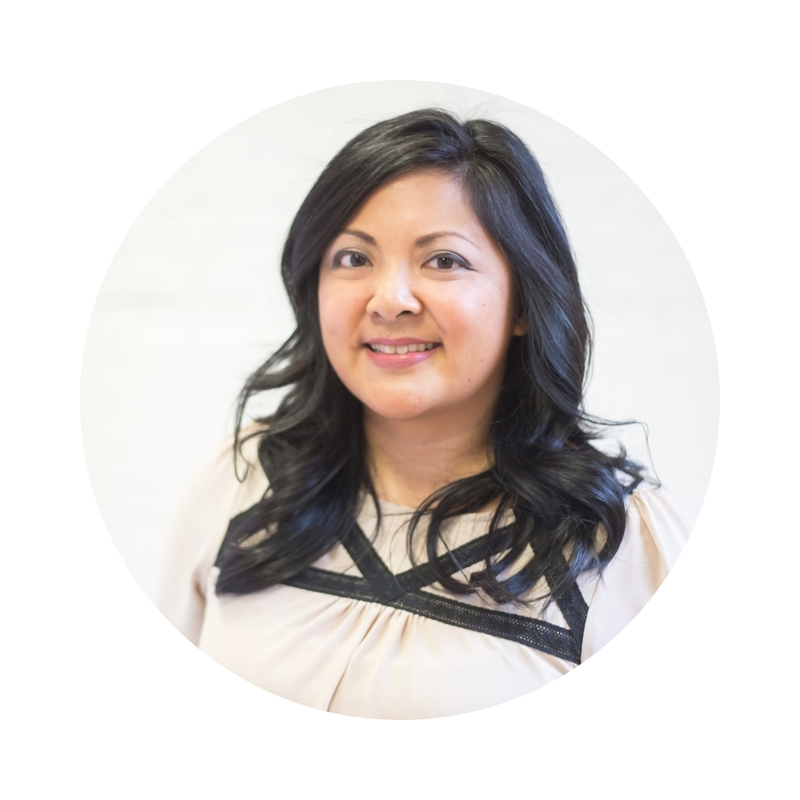 She took a beautiful large industrial space and turned it into a carnival!! I am all for mixing up modern and traditional, old and new, but that bedroom turned out to be so ugly and out of wack my husband and I were in awe! She always tried to use her own furniture which were OK but again, over priced and now her gloomy paint collection, even if it doesn't work in the space. I could see Sarah's design style changing in her farm house. I liked most of it, except for the living room which for me had too many colours all mixed together. I will still watch the show, but I am not expecting to like much of it.